"A thick 'fog bank' lingers offshore over the ocean." Artist comment: "It is early morning and the rising sun pushes back the fog. I wanted to capture the feeling of cold dampness in the receding fog bank as it hangs over the ocean and cliffs of the Pacific Northwest Coast. In contrast, I depicted the brightness of the wave and foam patterns at your feet. Beginning with the sky, I brought that same blue down to the surface of the sea. Wave after wind driven wave rolls in, to splash into open patterns around the rocks. I completed the scene with my typical 'M' birds against the sky." 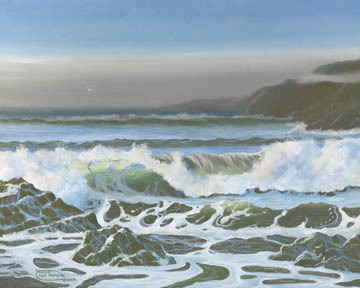 "Fog Bank" is a limited edition, giclée print from an original oil painting by Carol Thompson. The edition includes 3600 authorized, signed, limited edition prints (3500 numbered and 100 artist proofs). Release date is June 2014. Image size and substrates vary. All prints are signed and numbered by the artist and include a certificate of authenticity. Paper prints are shrink wrapped on foam board. Canvas prints are coated with a protective spray.